Low carb grocery trips don’t need to be a paranoid experience. Let’s get in and get out – unscathed by sugar. 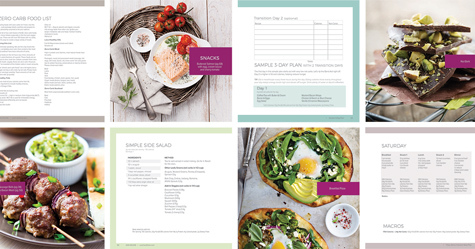 You’ll need a list, a strategy and an appetite for weight loss. A printable list adds instant confidence, especially when you’re faced with so many temptations. High carb foods are literally everywhere. Some grocery aisles are much safer than others. This low carb grocery strategy helps you plan ahead and stick to your list. Grab your master plan and start shopping. First, cling to the sides of the store. Shopping the perimeter is a good strategy for low carb. The aisles are where most of the high carb and processed foods live. Second, don’t leave the house without your armor. In this case, your low carb grocery list. A planned grocery list will save time, help your focus stay on low carb and prevent dangerous food purchases. Shop your grocery like a seasoned low carb pro. Whip through those aisles like a tub of heavy cream by concentrating on the smartest low carb choices. 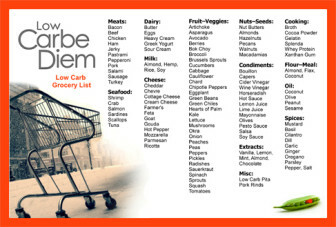 Use our printable low carb grocery list (download below) when you shop. Almost all foods in this grocery area are fine. Eggs are flexible, fast and extremely nutritious. They have the perfect fat-protein-carb ratio. Oysters and liver have more carbs. Some low carb diets limit these in the Induction phase. Some packaged meats are processed and contain nitrates or added sugars. Read the labels carefully. Dairy is essential on your low carb grocery list. Dairy foods are full of fat and protein, keeping you full for hours. Shop for cream, grass fed butter, full fat cottage cheese, sour cream, hard or soft block cheeses, ricotta and full fat, sugar-free yogurt. Healthy fats are a staple on every low carb grocery list. Most low carb experts argue that foods high in saturated fats are not a problem in the context of low carb diets, while a few others avoid them. Butter, MCT oil, olive oil (particularly recommended), avocado oil and coconut oil are staples on every low carb grocery list. Focus on oils that are high in omega 3 fats. Partially hydrogenated oils should always be avoided. MCT oil is an easy way to increase your healthy fats. Add to salads, smoothies or your latest fasting plan for immediate, all-day energy. It’s a good idea to have frozen meats, fish, vegetables and berries on hand. Avoid everything else in this area. Seriously. Canned black or soy beans, olives and coconut milk shorten cooking and prep time. Measure each serving and use sparingly – canned beans and veggies are higher in net carbs. Some canned foods have added starches and gluten. Most nuts and seeds, including nut and seed butters are fine after the Induction phase. Check the label for net carbs per serving, as each brand is different. Some low carb diets avoid legumes – this includes peanuts. Fresh flax, almond and coconut flour/meal are great for baking. Specific low carb spices and herbs help you lose weight quickly and naturally. Most have only trace amounts of carbs per ounce. Spices and herbs are an excellent way to flavor and season without adding carb-filled sauces. During the Atkins Induction phase 1, allow no more than 2 to 3 servings of sweeteners, sugar-free flavors and sugar-free syrups. Avoid aisles with baked goods, cookies, crackers, bread (unless it’s for low carb bread), candy, pasta, baking supplies and anywhere the processed foods lurk. Don’t get sneaky. Don’t include these on any low carb grocery list. To recap – just say no. It’s been a long day, and you don’t feel like cooking. You’re wandering up and down the aisles of the grocery. Put together a low carb ‘grab and go’ meal at the grocery. Choose a handful of protein, any of the 65 low carb fruits and veggies, and plenty of healthy fat. Try tuna, chicken, or shrimp salad, that you can either eat on it’s own, or pre-wrapped in a low carb tortilla or lettuce leaf. Vegetable salads can be good low carb grocery choices. Just make sure the dressing is full-fat and low sugar. Guacamole can be purchased as a dip for cucumber rounds, celery sticks, or other low carb vegetables . Many delis have roasted chicken, which can be paired with a salad. Make a wrap with lunch meat (check for sugars in ingredients) and a low carb tortilla. Grocery store salad bars let you mix and match. It’s easy to control the net carbs, and keep the flavor and crunch. When in doubt about the dressings, blue cheese, or oil and vinegar dressings are the least likely to have added sugar. Alternative: Buy your own bottle. Look for salads with mixed greens instead of iceberg lettuce (lower in nutrients). Include a serving of protein and top with full-fat dressing or cheese. Deviled eggs, if available in your grocery store, are often near the cheese or a special area for store-made items. If you are unsure of the exact ingredients, limit these on your to-go low carb grocery list. Some stores offer prepared veggies in packages. Celery, mushrooms, green beans, bell peppers, tomatoes and broccoli are bite-sized, low carb and delicious raw. Pair low carb veggies with deli tuna/chicken salad or low carb dip. Low carb fruit at the grocery is a good choice – if you’re past Induction and it fits into your plan. Smart choices are berries, avocados, tomatoes or any of the 43 low carb fruits. Individually-wrapped small portions of cheese (usually wax or foil-wrapped) are easy to find. Mini cheeses are a convenient and portable protein source. Examples are Mini-Gouda and Mini-Bel. Finding yogurt that is sugar-free AND contains live yogurt cultures AND doesn’t have objectionable additives AND tastes good? This requires hunting, but it can be done. Flavor plain yogurt with berries, sugar substitute, sugar-free jam, or any other flavoring that sounds good. For a quick bite of something sweet, packs of individual sugar-free gelatin cups satisfy. Sugar free gelatin is available in dozens of flavors. Blend with whipped heavy cream for a low carb dessert. It’s hard to find meal replacement bars that are sugar-free and don’t have ‘diet stall’ sugar alcohols like maltitol. Atkins Advantage Bars are one brand that work for many low carbers. However, some Atkins bars contain maltitol so read each label carefully. Starting a low carb diet requires making different choices at the grocery. You don’t want to feel like you have ‘nothing to eat.’ Choose a variety of options from the low carb grocery list.